Tessellations--shapes repeated again and again to fill a plane without gapping or overlapping--create intricate and seamless pieces of artwork, like M.C. 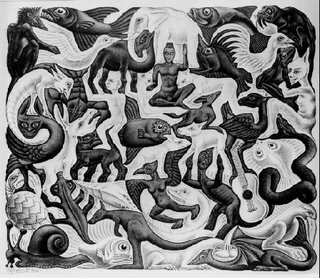 Escher’s work shown here. A reprint of this specific work hangs on a wall near my desk. 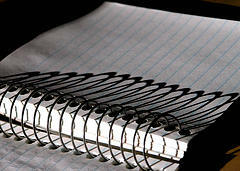 My eyes drift toward it whenever I’m tired of working with words. The blend of animals, people, and fantasy creatures transports my mind to different places, stories, and memories. Somehow Escher’s art refreshes my thoughts. I glimpse something different each time I look into it. Escher once said, “I don’t grow up. In me is the small child of my early days.” I think this statement is true for many people. My inner child still thrives as a big part of who I am today, from the activities and sports I choose with my kids to the stories I write. My fiction follows from adventures I lived as a kid. My grandparents and parents owned 27 acres of farmland on the outskirts of Allentown, Pennsylvania, and I remember exploring every square inch--the tops of the tallest pine trees that bordered the land, the sugar maples near the houses, the silk mimosa tree, the barns, garages, root cellar, tree house, manmade pond, attics, basements, and hundreds more intriguing places most kids would love to explore. It seemed endless. The strangest aspect about fiction is how real it becomes as we write it. I remember telling someone recently in an email that I grew up on a 32-acre farm. But that was wrong. I simply typed my fictional number instead of the real one. Somehow my stories are becoming more real to me than the real place I started using as my fiction base. I don’t know if this is good or bad or if it matters. Unfortunately, that farm no longer exists. A huge freeway runs through what used to be a childhood paradise. Yet I can’t think about that aspect. Even though it’s been replaced with rebar, concrete, asphalt, and barriers, its special hideaways and secret places still exist in my memory, or at least most of them. Tessellations usually apply to art and math. Of course, not all shapes can tessellate. In the same way, not all story details, words, or plot ideas work together, seamlessly. But writers need to achieve seamlessness. In Self-Editing for Writers: How to Edit Yourself into Print, Renni Brown and Dave King write, “The surest sign that you’re achieving literary sophistication is when your writing begins to seem effortless.” Writing, of course, isn’t effortless. But the illusion from the outside reading in is what matters. Fred Astaire made dancing look as natural and effortless as walking. M.C. Escher made art look so easy. Graceful authors do the same for their fiction. I hope that one day my fictional stories will flow as effortlessly as Escher’s tessellations--without gaps in plot or overlapping and repetitive words in the details. In his book, A Dash of Style: The Art and Mastery of Punctuation, Noah Lukeman reminds us that even the punctuation should be seamless. I guess it’s all just a matter of practice, practice, and ever-flowing practice. I'd love to hear other bloggers' input here. Do you use certain techniques to go seamless? What kind of exercises do you apply? What craft books do you use? I'd love to know, and I'm sure other writers would, too.